Which Faucet Type Is Right? Choosing the right faucet for your kitchen or bathroom depends on the design and features you are looking for. Shop through traditional, and modern designs with Danze, Kraus, and Fresca. If you’re looking for a new faucet as a quick kitchen upgrade or you’re looking to install all new faucets in your home for a new home renovation project, you need to understand which type of faucet meets your needs and expectations. For kitchen faucets, pull down and pull out faucets are two of the most popular options. Both features are exactly as the name implies — pull out and pull down faucets. These faucets are the most convenient types of kitchen faucets. Every faucet is either single handle or dual handle. Depending on your personal preference (and how much clearance you have between your kitchen backsplash wall and faucet), you may find that a single lever faucet makes more sense than a two lever faucet (or vice versa). 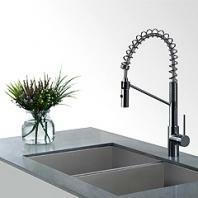 Commercial kitchen faucets are available for consumers depending on the brand and manufacturer. Commercial faucets usually feature a flexible and long spout designed to make cleaning the sink easier. Spray faucets is another convenient function that many households choose. Other types of kitchen faucet features include motion detection (touch on, tap on, and touchless faucet types), and pot filler faucets (usually installed directly by the stove range). Advanced faucet features include water filter, hot water and cold water dispensers, bar sinks and bar faucets, and prep sinks and prep faucets. There are many bathroom faucet types on the market today with and without advanced features. While a standard bathroom faucet works for some households, you may want to consider a hi-tech bathroom faucet for a master bathroom or guest bathroom. It’s a great way to increase property value for your home. Installing a water waving bathroom faucet and shower faucet is also a great idea for your home. If you notice a WaterSense label on a bathroom faucet, you can know that the faucet uses 30 percent less water than a standard faucet. Bathroom faucets can add personality and home decor value by defining a style and bath decor. For a traditional home or Victorian bath, a bridge and widespread faucet look beautiful with vintage-inspired bathroom vanity mirrors and stone wall tiles. For a contemporary bathroom decor, popular faucet finishes include chrome, stainless steel, brushed nickel, and satin nickel. Gold or warm metal finishes such as brass and oil rubbed bronze can add a touch of glamour to your bathroom decor. Vessel sinks and basins are paired best with vessel faucets which are taller than other types of bathroom faucets. 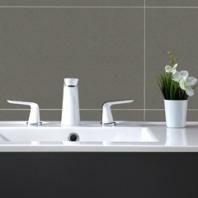 Vessel faucets are typically single handle to maximize functionality and space and maintain minimal design. Wall mounted bathroom faucets can offer a clean look by opening up the bathroom sink and vanity area. This type of faucet can also clear up countertop space by decluttering the sink area. Because this type of faucet is installed on the wall, cleaning and wiping countertop is a breeze.